Having a vintage theme has been on-trend in wedding styling for a number of seasons now. We live such hectic, stressful lives that it’s not surprising that many brides want to use their celebrations to look back to a more glamorous and sophisticated vintage world. Our marquee signs are the perfect accompaniment to a vintage wedding. However, one of the problems that brides-to-be and event planners can face when creating a vintage theme is how to make it truly unique. The Pinterest boards are bursting with ideas but many have been done before, and we know that you want something special to really give your day the wow factor. One solution is to use our beautiful vintage light up letters which are taking the wedding world by storm in 2014. These gorgeous 5ft high large letters have their roots in the bright lights of Broadway and so they have a great vintage pedigree. It’s every girl’s dream to have their name up in lights and now we can make your dream come true. 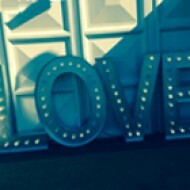 Our wedding initials or a light up LOVE sign or perfect centrepiece for your big day. They can be used either inside or outside and, as we can provide individual letters, you can make any word you want to fit your theme perfectly. Use them to highlight the bar to guests, have them placed at the reception for great photo opportunities – or you could even have them behind the altar as you get married! Of course our personalised fairground signs mean that you can make your event as individual as you are. You can spell out your initials, your names or your new married surname in sparkling vintage light letters. These really are showstoppers. Create your own slice of vintage Hollywood with big light up signs shining on your wedding day. Why not spell out the word Hollywood with our lovely letters and ask guests to come dressed as their favourite movie star. Lay out the red carpet for the bride and groom and hire a Rat Pack style band and you can make the Hollywood Hills come alive. Nothing says style and sophistication like our light bulb letters. Take your guests back to the decade of decadence and dancing, and illuminate the night with giant vintage letters. Taking your inspiration from the 1920’s you will dazzle your guests, and combined with a cool monochrome theme your wedding will become the talk of the town. Vintage style is perfect for a relaxed summer setting. Get back to nature with simple flower bouquets, rustic trestle tables and pretty tea lights. Our vintage letters with lights make the perfect outdoor feature as they can easily be placed anywhere and look lovely sparkling in the dusk of a warm summer’s evening. For some more great ideas for wedding styling using our vintage letter with lights why not have a look at our Pinterest boards. ← Will this be the year YOU propose?